Have you put your white sheet away yet? If you are a Republican that’s not an easy question to answer. You have been condemned to be a racist and will be part of Hillary’s “radical fringe” no matter what you say, do, or believe. Democrats aren’t wasting time with the truth. They have gotten right to the point and are focusing on one thing: if you don’t agree with what they want and especially if you support Donald Trump, you are a racist. No dispute. End of story. It’s an easy argument to make. Whether you lean left or right most of us like to hear things that support what we believe. The left has inundated the country with charges of racism and hate directed at anyone who doesn’t agree with the Democratic Party’s plans for the future. It doesn’t matter that minorities who are being threatened with persecution at the hands of the GOP have gone nowhere after eight years of Obama and an early first term Democratic majority that brought them nowhere. Without a doubt that’s because of Republican racism, too. Racist? How Democrats see you. They hate that. If you don’t agree, you are a racist. Nothing you say matters. Nothing will change liberal minds. The fact is that if you are not one of them, you are a racist. Vote Republican, that is. A vote for the GOP and Trump, in particular, is prima facie evidence of your guilt. Lucky for us it’s not the primaries. We don’t have to declare our racist proclivities out loud. Just keep doing what you’re doing and thinking what you’re thinking. Only a devout racist could believe what you believe. Racists are inherently selfish. The cure is to spend lavishly and take lots of credit for how you helped minorities by punishing the rich. That’s proof you are not a racist. If you lean to the right and protest at a Clinton event, you are a racist. Don’t do it. On the other hand, if you are a Democrat and disrupt a Trump appearance your behavior makes you a responsible liberal American. Good for you! Don’t let the cops get away with the same kind of racism you are guilty of. If a suspect is a person of color, the police have undoubtedly crossed the line. Only white people commit crimes. Don’t expect them to follow the same rules our citizens do, like paying non-resident college tuition. Racists forget they used to be immigrants, too. These tips should be enough to get you on track to be a better Republican racist. If you need more guidance, the picture should help with your attire. Don’t feel bad about it. You have already been judged and found guilty. If you want to atone for your racism, there is still time to vote for Clinton. It won’t make things better, but it will keep Democrats from spreading lies about you. 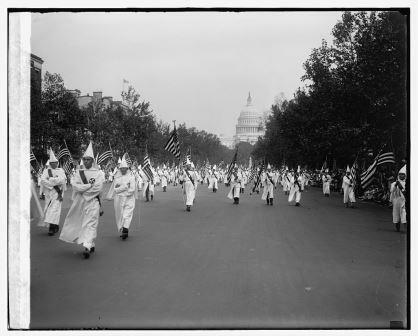 Picture credit: “Ku Klux Klan Parade, 9/13/26.” Library of Congress. Originally published September 13, 1926. Library of Congress Prints and Photographs Division Washington, D.C. 20540 USA. National Photo Company Collection. http://www.loc.gov/pictures/item/npc2007016224/, retrieved August 28, 2016.